The Raffle is a key source of income for Chester FC – therefore we need CFU Members not only to buy tickets but also sell them to their family, friends and work colleagues. The Fundraising Working Group will be taking tickets around pubs in the local area and also selling them in the Chester Forum on a couple of days – for which we thank the council for giving us permission. However we need as many people out there distributing tickets as possible. This is a chance for everyone who loves the club to work together and really make a difference. Fan ownership – fan action – at its best. Although our managers are working wonders on the pitch, it has been a tough season for the club – especially with the flood at the stadium (and even international call-ups for our opponents!) depriving us of some lucrative Saturday fixtures. Aside from helping the club… who wouldn’t want to miss the chance of winning £1,000 for just a pound? 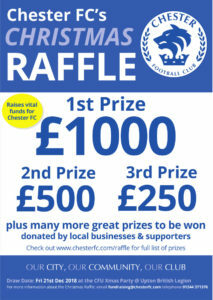 We have many other great prizes – checkout www.chesterfc.com/raffle – and we will be adding to the list in the weeks ahead.